Update your bedroom with the chic, graceful style of this platform bed from Modway. 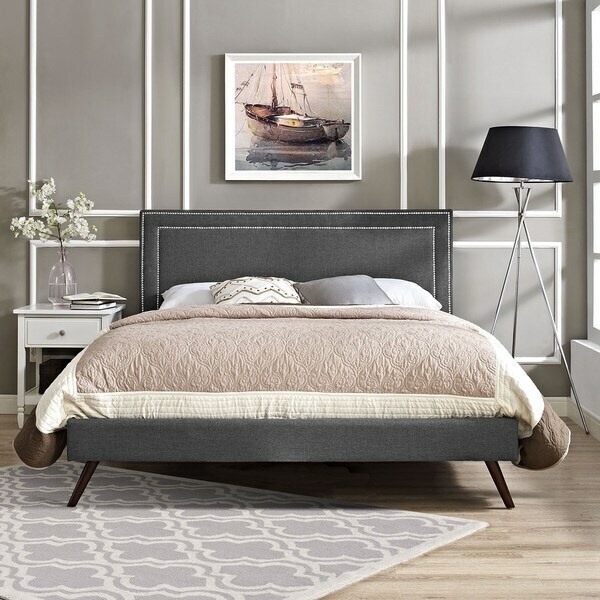 Fully upholstered in padded grey fabric, this bed features a large headboard with with white stitching in the border for contrast. The angled wood legs add a mid-century flair that looks great in nearly any setting. 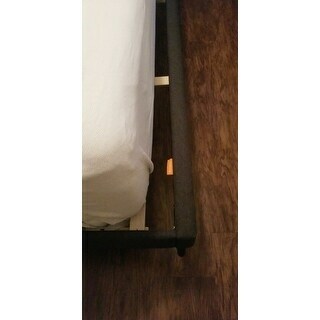 With its wood slat support system, this platform bed does not require a box spring. The grey is dark, it looks almost like denim. It's a nice design but the chrome buttons are all milled together making not look as nice as if it was individual buttons. THIS BED IS HEAVY. I ordered a king size, but listen, IT IS HEAVY. I did manage to assemble by myself (mid twenties - 120lbs - female) an electric drill would make your life easier since you have to make your own holes for the panels. Took all in all one meltdown and about 1.5 hours by myself. Most of that time was trying to move my mattress. Also, it sits up pretty high. Other than that, its a nice bed with a good design. This was my first order from Overstock. I was a bit hesitant but read the reviews and felt confident I had made the right decision. I also had someone assemble it, which is a great add on through Overstock. It's well made and very supportive. The only thing I would do is add a box spring for added comfort. I did add a foam topper and this makes up for the lack of a boxspring. It's a gorgeous piece. I would recommend it! Looks exactly like the picture they show! Love it! Has a contemporary mid century style that looks great with any style and color. The peg legs give it the mid century look and the nail trimmed upholestered headboard gives it that modern look. The slats aren’t sturdy and the legs can’t hold two average weight adults. We had to put box springs in the frame to use it. The bed is great and really has a nice stance. I have the King bed and it was fairly easy to assemble. Can be done with one person but will be much easier with one more person for a couple of steps. 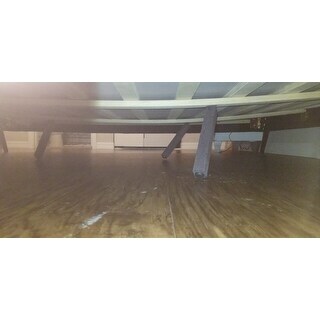 Another reviewer posted below that the bed is darker than you might believe. That is true. The bed is a dark grey. Either way, very pleased with the bed. We are happy with this bed frame. Decent Quality. Should hold up for some time. 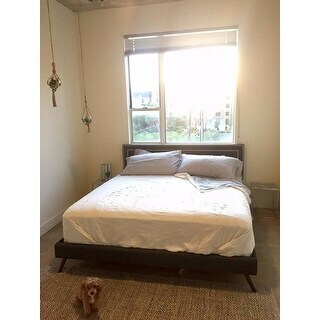 Gorgeous mid-century bed, very easy to assemble and extremely sturdy. It would complement with its elegant and classy vibe every bedroom. The headboard is very elegant and it adds a modern tone to it. Very happy with the choice of buying it. Beautiful bed. Delivered on time. Only one little tiny thing wrong. One of the silver buttons has a hole in the center. It was on top of headboard too, not on the sides. But what can I expect since I paid a cheap price for this bed. Definitely not a big enough thing to return the whole bed. Looks great when put together. Took my husband a little while to assemble, but looks good espically for the price. My one complaint is that the nailheads are all connected. There is a slight eye sore when the nail head long pieces overlap. My plan is to have big pillows. It is sturdy. Middle slats broke within a few weeks. The worst. Received very quickly. This comes in two shipments, which were about a day apart, so don't freak out when you only receive part of the bed. Easy assembly. Sturdy and attractive. That was the first day, this bed it to weak. "How many inches are between each of the slats?" There are 2.5 inches between each slat. "Hi - What is the height from floor to top of side rail? Thanks!" "Does this come in a queen size?"